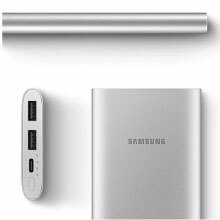 Dual-port charging capability, Samsung Portable Battery can power two devices simultaneously for added convenience and far less hassle. 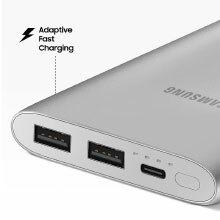 The new Samsung Portable Battery charges with Samsung Fast Charge and Quick Charge 2. 0 support that lets you power up quick when you’re on the go. Overcurrent and Over Voltage Protection means you’ll power up safely without having to worry about excessive current levels damaging your device. Twice the advantage. 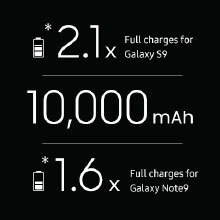 Thanks to its dual-port charging capability, Samsung Portable Battery can power two devices simultaneously for added convenience and far less hassle. Click the 'Battery Check' button on the top of the device to instantly switch between fast-charging and dual-charging with two devices. Power up two devices at once with the dual-port capability. Supports Fast Charge when used with a single device. The convenient way to stay charged. Features a low current charging support that’s compatible with a range of third-party and Samsung devices that charge throuh a USB-port. Samsung Portable Battery features a slim, light and ergonomic design that makes it a comfortable fit to keep close at hand. It also comes in two distinctive color options to go well with your sense of style. 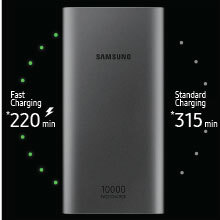 With a charge capacity of 10,000mAh, Samsung Battery Pack delivers plenty of boost.